There's nothing more frustrating that not finding what you are looking for when you need it. I am notorious for not finding things and "knowing" it was "right there!" yesterday or even a few seconds ago. Today I am redoing my studio area. After years of doing illustration work I've decided to move my focus into other art avenues. In doing so I need to reorganize my work area to be more suitable for my projects. Now I've generally kept my work area as organized as possible, but with deadline crunches and sometime utter laziness things get a bit, shall we say, untidy. I have however found a few ways that honestly work real well to keep things organized, always let you know what supplies you have on hand, and make it easier to find what you need when you need it. Nothing says "Never See It Again" more than a box, closet or solid drawer. Storage like this is where things go to die. Keeping things in view is essential to knowing what you have and where it is. Before I started storing things this way I can't tell you how many times I've bought something I already owned or completely forgot I had something only to stumble across it a year later on accident. 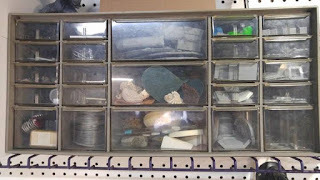 This kind of storage also keeps things in sight, readily available for use and if it is something you don't use often it might just help spark an idea or make you use something you might have forgotten about if it was under your desk in a box. Open and clear storage also helps save time. When you can see it and get to it easily it gives you more time to work on you project instead of searching for the box with your paints or glues. I used to keep a large majority of my supplies in cardboard photo boxes you get from stores like Michael's. Each box was black (because I like black) and nothing was labeled. I would spend more time digging through boxes than working on what I wanted to. This is something new I started about a year ago. I have an old label maker and started printing out sticker labels for some of my storage containers. 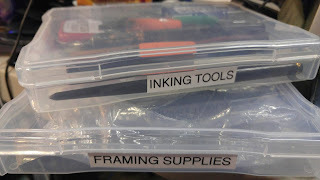 I had picked up a bunch of 5x7 and 4x6 clear plastic photo boxes from my local craft store and started filling them up. Although it worked great for storage, knowing what was in each box was tough when they were stacked up on my shelf. That's where the label maker came into play. With each boxed labeled it makes it as easy as pulling a movie or book off a shelf and getting exactly what you want when you want it. Although this isn't a storage solution this is something to keep in mind when organizing your studio/work space. Keep the things you use the most or on a daily basis the closest to your reach and things you don't in view. For example - If you sculpt, things like sculpting tools, clay and brushes might be things you used daily. These would be kept in reach of your work area. 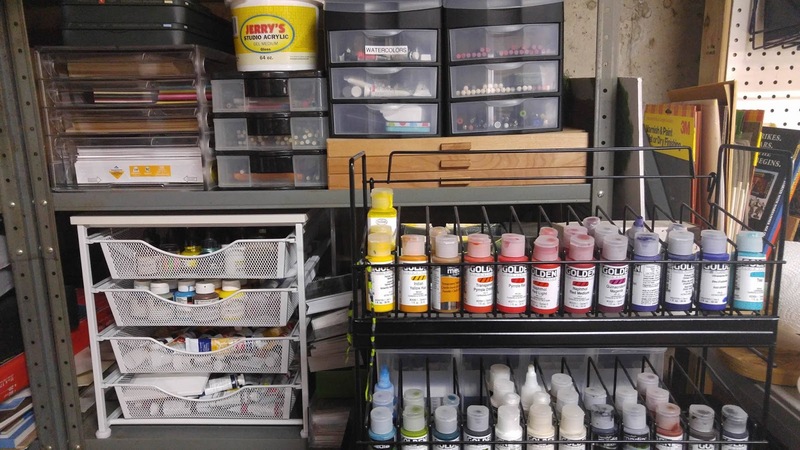 If you sculpt and on the occasion have need for oil paints, this should be something that is kept in sight, but not necessarily in reach of your work area. I've seen shots of peoples work areas that are utterly amazing. Beautiful laser cut storage, high end shelving from IKEA and full out of the catalog studio setups. Although this might be the best looking solution it for some might not be the most affordable or even necessary. Although it is great to have a cool looking work space, functionality should when possible come before appearance. Does the setup do what I need it to do? Can I find everything easily and quickly? Do I have enough room to do my work? Can it handle larger projects as well? If you answer "No" to any of these questions you might have to look into other work space options. I've found tons of great storage and furniture from local businesses that were closing and selling off their fixtures and displays as well as flea markets and yard sales. 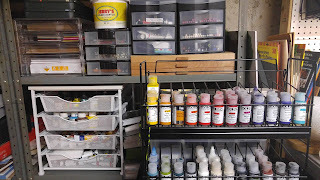 I've found paint racks, marker racks, tables, and various tool storage super cheap and sometimes even free. Just because it's used doesn't mean it's useless. One man's trash is another man's treasure. 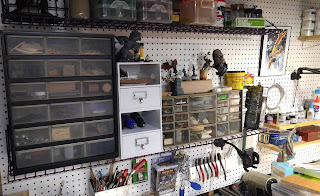 I found personally that pegboard is a great way to setup various storage options fairly cheap. 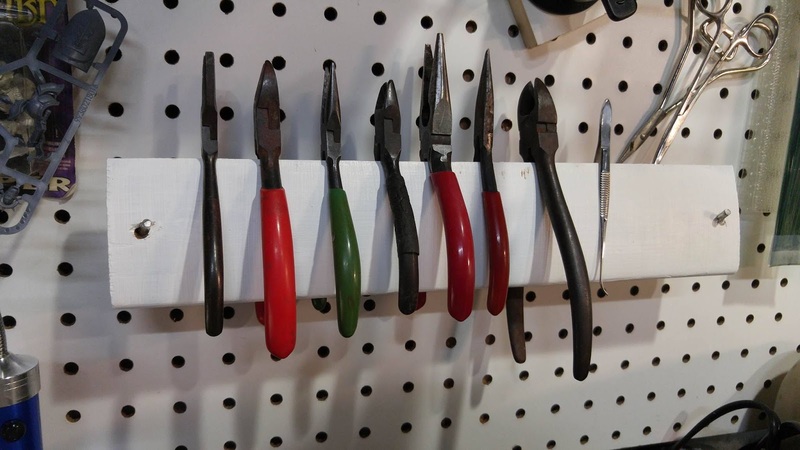 Pegboard shelves, hooks and storage are available at most large hardware stores like Home Depot or Lowe's. I find myself redoing my studio area every so often easily because of having pegboard walls around my work area. Another option is from the chain craft stores like Michael's and Hobby Lobby. These places carry a pretty standard white press board/modular storage system that my wife and I both have and still use tons of today. The pieces can be a bit pricey on their own but, these stores are infamous for their weekly coupons and sales. 40-50% coupons each week as well as the occasional big yearly sales are great to take advantage of. This is also a great place to get clear/frosted divider boxes, clear photo boxes and other unique storage options. Defiantly keep these stores in mind when you are looking for new storage solutions. If you can build it...why not? Simply put, if you are skilled and have access to the tools or know someone who can build what you need, do it. I've got access to a few tools that have come in handy to make various storage and organizers for my work area. With a few pieces of scrap wood, some screws and some paint or wood stain you would be surprised what you can make for your work area for next to no cost at all except some time and creativity. 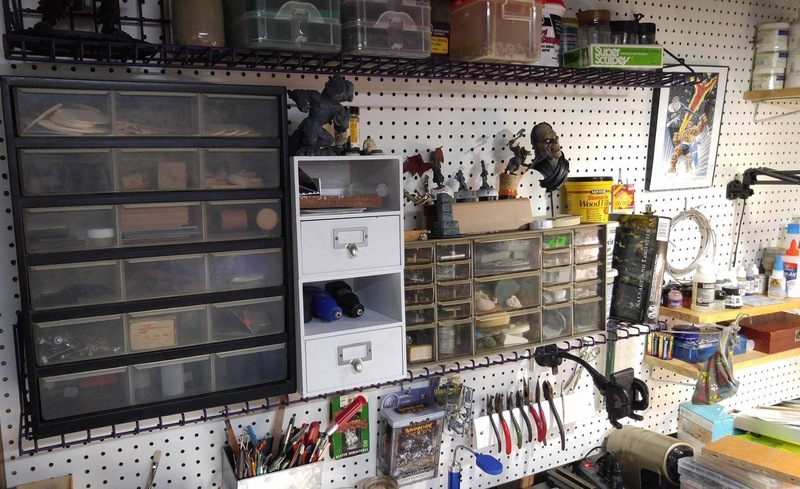 When looking for items to use in your work space/studio keep an open mind. An old spice rack might just make a great paint rack. Empty peanut butter jars might just be the thing to hold all your paint tubes or sand for building gaming terrain. Empty mint tins could be perfect to hold all those loose or use hobby knife blades. Old coffee cups could be just the thing to hold all your paint brushes. Yes that dreaded cleaning. This is the hard part but needs to be done. Once you have your designated place for something it needs to go back there when you finished using it. This doesn't mean doing it daily. I "try" to do this every few days or at a minimum, once a week. Putting things away on a regular basis not only keeps things where you want them but helps put you in that routine if keeping things where they belong. It also keeps your work area ready for a project at any given time without having to spend a day cleaning just to work on something. I hope this gives you some ideas or inspiration when setting up your work space. Works spaces and studios are a never ending and always changing setup. It takes time and creativity to get your area just the way you want it and with the functionality you might need. If you have any questions or comments please feel free to post them below. Sketchbook Drawing - #2 - Everything I need and more! My new sketchbook video is now up featuring many great Kuretake pens and markers! Sketchbook Drawing - #1 - Dinosaurs Are Awesome! New videos series up and running! Don't forget to Like, Share and Subscribe! So I took a little more time and started working on some color and texture tests. I've decided to stay away from oils, at least for now and go with either watercolors or acrylics. I'm extremely comfortable with watercolors, but I'm not sure I can get the end result I'm looking to get with them. Acrylics will give me the results, but I'm not as comfortable with them as I am with watercolors. 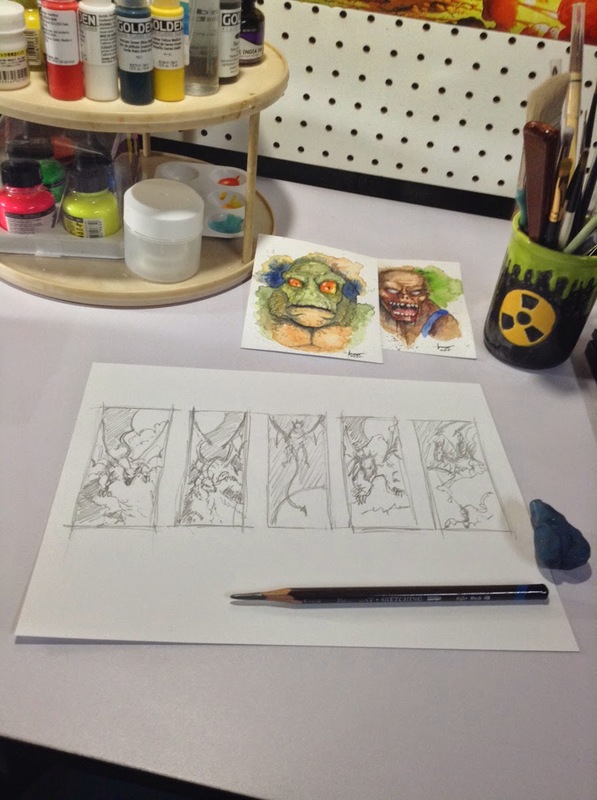 In the image below I took a pad of 140 lb Cold Pressed Watercolor Paper to do some further thumbnail tests but this time with color. I quickly re-sketched the 2 original thumbnails I preferred, this time with a black colored pencil. With watercolor paint I did simple washes over the sketches to see a simplified version of what I'm looking for color wise. Along with the color tests I decided to break out some acrylics and see how they did doing some scale texture tests. I wasn't happy with the initial tries (the ones in the middle) but did like how vibrant the colors were. I decided to give it another try (lower right) and found that this was more, texture wise, of what I'm aiming for. The green "palette" in the photo is my first time using a Wet Palette. This is a homemade one and I was very happy on how it worked with the acrylic paint. I will defiantly be making a larger one now that I know it's something that works for my style of painting. I went cheap, only spending $3.00 on the materials to make them. 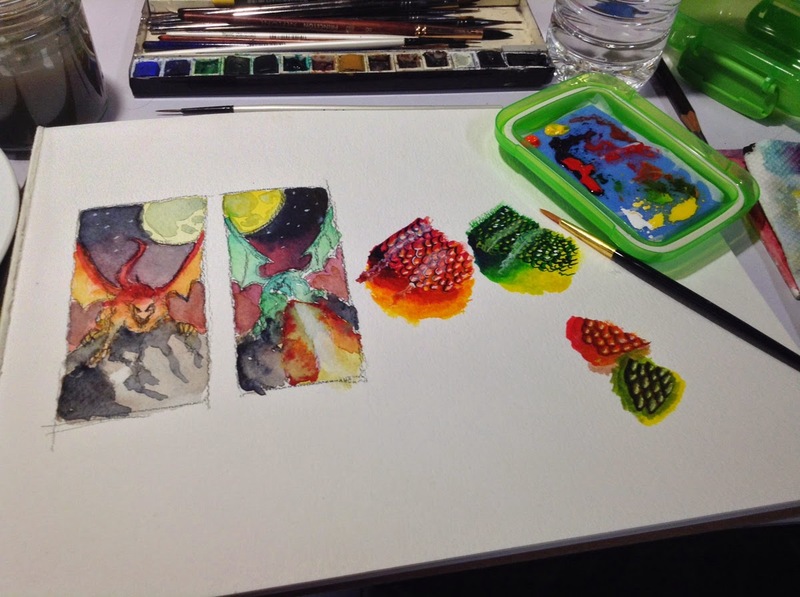 I was able to make 3 small wet palettes from the materials I purchased. I'll be posting a full tutorial and a possible video on how to make one and what materials are needed. I just finished up a fairly large sketch card set this week and still have a few commissions to finish up, but needed a day to relax and put some ideas I've had down on paper. I'm starting to venture into other mediums in painting. I've oil painted years ago and I'm contemplating on trying them again. I've been dabbling in acrylics but they lack that smooth flow I'm used to with watercolors and seem to dry compared to what I remember about oils. My hesitation towards oils is all the chemicals needed to paint with them. Well to get back to my idea sketching. I've gone out with my wife to a few thrift shops looking for frames. Frames can be a huge expense for artists and can dig into your selling price for finished pieces. So with that I figured why not try a cheaper alternative. We found a few decent ones over the past few days. Some in great shape too with a couple that might need a little TLC but nothing major. One of the frames is an odd, long shape that is just perfect for one of the painting I want to do. The thumbnails below are the starting point I'm going with. I'm sure there will be further changes and adjustments, but I have a good idea where this one will be going. My next step will most likely be going onto watercolor paper and doing some color comps to see a rough layout, still with the thumbnail feel and limited to no detail. Just enough to see if what i have is the direction I want to go. I'm still not sure what the final painting will be done with though. Decisions, decisions.... I'll be posting more on this over the next week so keep checking back! Spent some time at the Mystic Art Center this weekend for their Young At Art show. There are hundreds of amazing pieces there from many talented kids from Elementary school to High School. here's a few photos from the show. I wish I had time to take photos of everything there but there was so much to see that if you are in the area it's better to go and see for yourself. You won't be disappointed. Sale time in my ETSY store! Use the Coupon code MARCHMADNESS2015 and save 30% on anything and everything in the store from now till March 31st! © 3DXSTUDIOS. Characters are © their respective owners. Awesome Inc. theme. Powered by Blogger.